12 months on from an ambush in the Aviva, will England be wary of falling into the same old trap against Irish ‘underdogs’? Jonathan Sexton during kicking practice at Twickenham in 2010. BEFORE THE TOURNAMENT started, we all looked at that last fixture on the list. 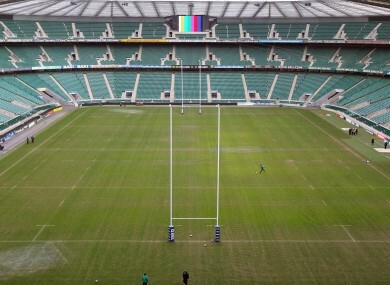 ‘Huh-ho, Twickenham on Paddy’s day.’ A great spot to be if you’re winning. England started off playing even worse than anyone expected, but vitally, they refused to lose; and they had jewels in that tarnished crown. They had Owen Farrell impudently railing against the perception of his team – and this is his team – the new front rows were withstanding every test; Mouritz Botha was a dog in every great second row sense of the word. Stuart Lancaster’s only mistake in those opening skirmishes was to overlook Ben Morgan in favour of the pedestrian Phil Dowson until Wales came calling. They would be bolstered with the return from injury of Manu Tuilagi and, we assumed, Toby Flood. We assumed too, that they would lose heavily against Wales and France. We thought that Lancaster may be a beaten docket by now. instead,3 he’s riding a crest of a wave. The chariot has only just shoved it’s head above the radar. A year ago, a brash, bombastic juggernaut of a team trundled down Lansdowne Road expecting a Grand Slam and was duly dismantled - only five players from that team started the win in Paris. England are an exciting, vibrant and plucky young team just going out to ‘give it a lash’. Until this weekend they were also underrated. That underdog mentality is favoured by Ireland, and our camp have already begun the arm wrestle to go begin the match just so. Ireland’s ability to bring a manic tempo to this fixture has been a source of frustration to the viewing public who simply wished they could churn out the same kind of hunger against Wales or France. Teams who are our better or equals depending the year. Declan Kidney has been criticised for previously struggling to squeeze back-to-back performances from his team. Yet here we are after three in 14 days and aiming for a fourth on the spin. That may be down to the unusual circumstance of this tournament or that the absence of the traditional leaders has refocused the mind. Praise must also go to Anthony Foley, who entered the setup as forwards coach on the eve of the win over Italy. Yesterday it was Foley who planted his right elbow on the press conference table and took a firm grip of the tag which read ‘unfancied’ and began to heave with all his might. Over the years, it has been easy for Ireland to raise their game and apply a superior skill-set to put England back in their place. The problem is, Lancaster’s team does not yet have a place. Up to now they have been desperately fighting for pride. This week the nation will dote on them, proclaiming a second coming before rugby football comes home in 2015. Ronan O’Gara gets to grips with Chris Ashton last year. / ©INPHO/Morgan Treacy. It would be only natural to let thoughts drift onto the unlikely prospect of a championship retained, hence Foley’s helpful reminder. In future, possibly even in the next few days, they may well develop that arrogance that ruled and ruined Martin Johnson’s team. They will set out to avenge last year’s Grand Slam non-event but Ireland will be expecting the ambush, Kidney deftly refused to describe his team as confident after beating Scotland and he was right to sidestep such a headline. He had another tone to set. Ireland must play as underdogs, because that is where Lancaster’s England have thrived up to now. This week England will allow themselves to be talked up, and if Ireland are off the pace they will be embarrassed by a young team brimming with confidence. Youthful confidence is easily shook, however and if Ireland front up early and quieten the crowd; Twickenham will once again be a great place to be on March 17. Email “Opinion: England have come full circle”. Feedback on “Opinion: England have come full circle”.